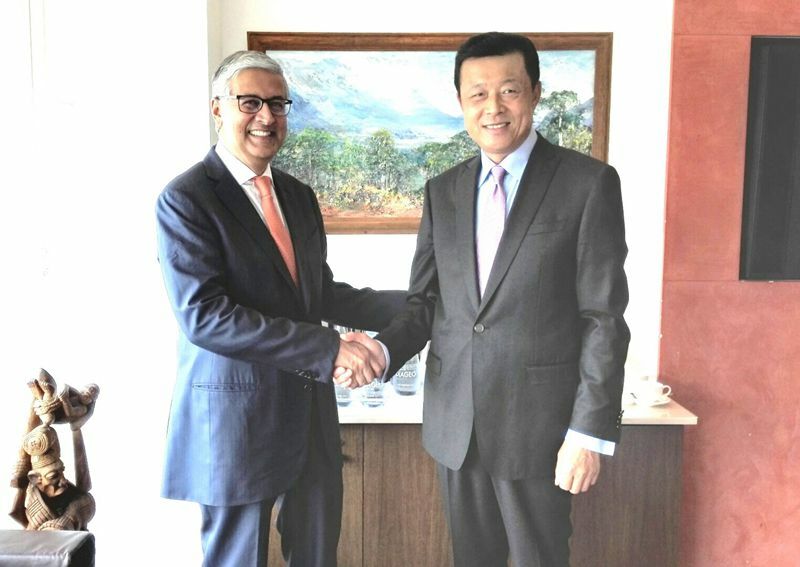 On 6 August, Ambassador Liu Xiaoming paid a visit to the headquarters of DIAGEO, and held discussions with CEO Ivan Menezes on enhancing cooperation between the two sides. Present at the meeting were Jin Xu, Minister Counselor for Economic and Commercial Affairs of the Chinese Embassy and Richard Burn, Global Policy and Public Affairs Director at DIAGEO. According to Ivan Menezes and his colleague, DIAGEO is now the world's largest producer of alcoholic beverages and one of the major producers of beer and wine. It owns famous brands such as Johnnie Walker, Baileys and Guinness. DIAGEO established its branch in China in 2002 and became the first foreign company acquiring a Chinese liquor brand by investing and controlling Swellfun. The Company is committed to long-term cooperation with China and will further expand investment in China. Ambassador Liu gave an introduction of the current "new normal" of China's economic development, where quantitative growth is replaced by quality growth. It focuses more on green development, improving people's livelihood and promoting R&D and innovation, thus creating more enabling conditions for Chinese and British businesses to cooperate with each other in related areas. Ambassador Liu commended DIAGEO's efforts in promoting Chinese liquor brands. He said that there are many outstanding liquor brands in China and that DIAGEO is welcomed to further explore the Chinese market and strengthen cooperation with Chinese companies for win-win results.